Skipping Fish Boat School is excited about offering 13-18 year olds an opportunity to build their own kayak while learning to safely paddle on our local lakes and rivers. We believe that the experience of learning new skills, building something from “scratch”and the celebration of it’s completion will help each camper walk away with a positive sense of self and a kayak that connects them to the wonder and miracle of our planet. 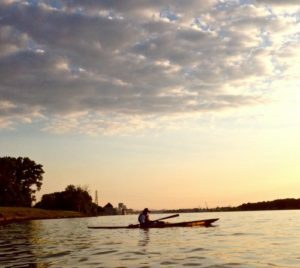 Paddle the 20 river miles from Westport to Louisville on Thursday, June 20th from 8 a.m to 6 p.m. This is a one day Ohio River expedition paddle experience that starts in Westport, KY and ends at the Louisville Community Boathouse. This expedition is for the “fit” intermediate/advanced paddler of 13-17 year of age. This three week daycamp meets 9 a.m.- 5 p.m. on weekdays from Monday, July 8 through Thursday July 26th. Your camper will build their own kayak, carve their own paddle and receive paddling instruction on local waterways. An additional week has been added to this building camp so campers can spend more time on the water using their new paddling skills, learning to roll, exploring and learning about Louisville’s historical river legacy and rich biodiversity. Camp fee includes the materials and instruction for camper to construct their own kayak and paddle, a Skipping Fish Boat School t-shirt, transportation to local waterways and paddling instruction. Campers will need to bring their own lunches but beverages and healthy snacks will be provided by Skipping Fish Boat School. Enrollment in the camp requires a $600 nonrefundable deposit. Cost of this three week camp is camp is $1650. 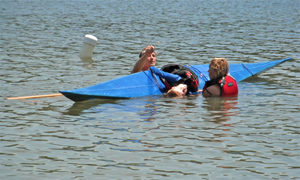 *Campers are responsible for providing their own paddling PFD (personal flotation device). They will need it to paddle the boat they construct. Spray skirts are available for purchase should your camper elect to use one after adequate instruction in its use. Enrollment is limited to 4 campers. Every adventure begins with a boat! Enroll today in Skipping Fish Boat School’s River Adventures 2013! This day camp will include two nights spent under the stars. Explore several area rivers & lakes while strengthening your paddling skills. Additionally, campers will learn about Louisville’s historical river legacy and explore the rich biodiversity of our local waterways. The adventure ends with a distance paddle, but you’ll be ready for the challenge! The camp fee includes transportation to local waterways, camp t-shirt , beverages,snacks and camping fare during the outdoor overnights. 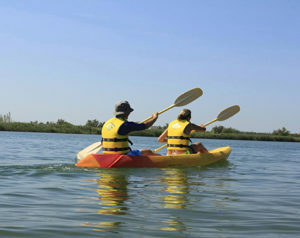 SFBS can provide kayaks if necessary for a minimal fee. Enrollment requires a $350 nonrefundable deposit. Cost of this camp is $685. *Campers will be required to provide their own paddling PFD, a kayak and three lunches. Enrollment limited to 6 campers. Please contact SFBS for information on kayak and paddle rental. Friday, June 14th & Saturday, June 15th from 9 a.m.-5 p.m.
Monday, June 17th from 9 a.m.-5 p.m. for advanced beginner, intermediate and advanced paddlers, ages 13-17 year olds. Hope to see you at the Cincinnati Paddlefest on June 22nd! Sebastian took his finished kayak to the Cincinnati Paddlesfest. There wasn’t a youth racing event at Paddlefest, so he simply registered in the Amateur Men’s SeaKayak class and finished 4th in the 11 mile race. It was the first time he had ever paddled 11 consecutive miles. It was also the first time he had ever paddled a boat of any sort in a race. At the age of 14, Sebastian paddled and once again placed amongst the finishers in the 11 mile race at the Cincinnati Paddlesfest and became the first youth on record to paddle a kayak from Westport, Ky to Louisville, KY in a kayak he had built himself! Sebastian is 15 now…and he’s thinking about taking everything he’s learned along the way about himself and boat design. He’s going to use it to build a new boat, because his next adventure, like his last adventures began with a boat! Our instructors are seasoned paddlers who have extensive experience and training, which includes CPR and Wilderness First Aid. Additionally, they are skilled artisans, full of encouragement.